In 2008 our daughter, Autumn, started raising Katahdin sheep. They are a breed of hair sheep known for hardiness, high meat quality, and adaptability to grass-based farming systems. Our goal is to eventually graze our sheep and cattle together in the pasture to better manage the weeds. The ewes and lambs are rotated between pasture paddocks. This makes the pasture stretch further than if it were continuously grazed and allows time for new pasture growth. Once the snow gets too deep for the sheep to graze we move them to our barn where they spend the winter staying warm and munching on grass hay. Once the grass is ready and the temperatures are up it is back out to pasture for the ewes and their newborn lambs. Grass-fed lamb is high in natural Conjugated Linoleic Acid (CLA) and Omega 3. We are happy to offer an entirely grassfed meat for consumers who are looking that option. The grassfed Katahdin meat is lean and has a mild flavor. Leg of Lamb………....................$ 9.75/ lb. Boneless Leg of Lamb……….....$ 11.50/ lb. If you are interested in purchasing a whole lamb for your freezer please let us know early in the season so one can be reserved for you. Custom processing is $8.50 per pound hanging carcass weight before trim. Registered Katahdin breeding stock is available for sale. 2018 lambs are weaned, we have a lot of nice ewe lambs to choose from starting at $225 per head. 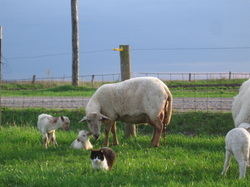 Attention beginning farmers or acreage owners: 10 head "starter flock" of ewes for sale ranging in age from 2-7 years. All proven and excellent mothers. Up to date on vaccinations, currently open, breeding is available.